What Do You Know About Glenn Kotche? Chops Percussion is proud to be the presenting sponsor for the Indiana Percussion Association. IPA recently announced their annual clinic day, which will take place at Franklin Community High School on December 12th. This annual event includes the IPA Individual and Ensemble contest, organizational meetings, and performances by clinicians. Check it out the details here and make plans to attend! Amongst this year’s exciting lineup of clinicians is Glenn Kotche, internationally renowned percussionist and composer. 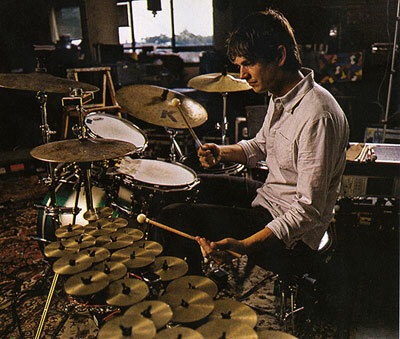 As a solo artist and member of Wilco, Kotche is regarded as one of the most creative drummers thanks to his percussion-centric approach to drum set. If you don’t attend the IPA clinic for any other reason than to see his presentation, it will be well worth your time. Kotche’s creativity has its roots in his education. He began percussion as a student, and continued his studies under Professor Jim Campbell at the University of Kentucky. He also spent a summers in the late eighties as a member of The Cavaliers. 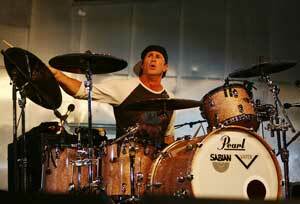 While studying percussion, Kotche also dedicated himself to learning drum set. Rather than approach the drum set like a separate discipline, he found creative ways to enlist the techniques and knowledge he already knew. He discusses this approach in the following video, recorded in Indianapolis at PASIC 2013. In 2001 Kotche joined Wilco, the critically-acclaimed neo-country, experimental-pop band prior to the release of their album, Yankee Hotel Foxtrot. His influence is immediately apparent throughout the album, with solid, creative drumming and percussion overdubs. The album opens with “I Am Trying To Break Your Heart”, a nonsensical love song surrounded by a cacophony of sound. Wilco has released five albums since then, including the Grammy-winning A Ghost is Born. Kotche is also a prolific composer, and has written works for groups such as Kronos Quartet, So Percussion, and the Bang on a Can All-Stars. Sonic experimentation, and the drum set as a percussion instrument, are central his works, just like his contributions to Wilco. Glenn Kotche is an innovative musician and composer. Few have successfully merged percussion, drum set, rock and roll, and art music so seamlessly. When he performs at the IPA clinic on December 12th, you won’t want to miss it! If you aren’t signed up for our Chops Transmission emails, you may be missing out on the most update happenings around the store. Below is the October edition of the transmission. If you don’t receive our emails, you can sign up here! There’s been a few more additions since last month, including some great deals on marimbas! Check out the current list to see if there’s anything you need for the upcoming indoor season. When Will I Need to Replace or Retune Bars on My Synthetic Bar Instruments? 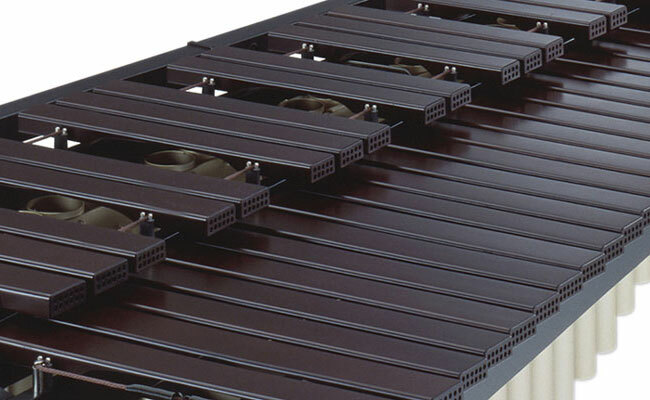 Occasionally when a school is faced with needing to replace their synthetic bars, or have them retuned, the question pops up of how long they normally last before needing replaced or retuned. 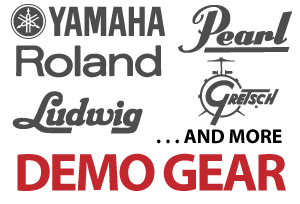 There are many factors that go into answering this question, so I contacted our friends at Pearl/Adams, Yamaha and Majestic to get some input on the topic. If you were born in October, then you share a birthday month with these famous drummers. Check them out here. Welcome back to the Chops blog! 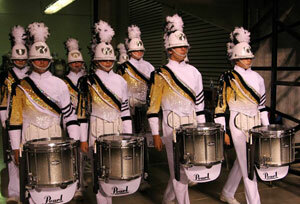 A couple of weeks ago Jeff wrote a great guide to the WGI independent drumlines in the area. If you haven’t already seen it, check it out here. Today I’d like to continue on the subject of drumlines by providing a few tips for auditioning. It’s critical that you enter an audition with reasonable expectations. While the world class corps and drumlines are the most impressive, only the best and most experienced candidates will make the cut. In other words, audition for a group that you have a reasonable chance of joining. If you’re still young, and have a limited amount of experience, you should consider auditioning for an “open”, or “A” class group. Membership in these groups is typically not as competitive, and will help a young student develop crucial skills and gain experience. Many members of the best marching organizations have many years of experience, including seasons spent with scholastic, “A”, and “open” class groups. The first group I auditioned for as a high school student was a “Division I” (now known as “World” class) drum corps. When I didn’t make the cut, I successfully auditioned for a “Division III” (now known as “Open” class) corps. After marching for two seasons with this smaller, younger corps, I was ready to march in a “Division I” corps and “World” class winter drumline. After you decided on a group, start planning your audition. Obtain the audition materials, figure out your schedule, and make arrangements to attend the audition. The more time you give yourself to prepare, the better chance you have of making the cut. This is as simple as knowing the audition material perfectly, from memory. The better prepared you are, the better chance you have of making the cut. In addition to learning the audition material, be sure to study the group and their playing style. Watch video of their latest performances to study the details of how, and what they’re playing. Be prepared for the audition to include some kind of surprise. It might include learning a new exercise or show music, or a different way of playing the material you already prepared. The staff will throw you some sort of curveball to see how you handle stress, adapt to stress, and how quickly you can learn. In addition to your playing and marching ability, you will also be evaluated on your social skills. Drum corps and winter drumline seasons are long, and can be stressful, so your ability to get along with others is crucial. Don’t let the competitive nature of an audition affect you negatively: be friendly to everyone, including the other audition candidates. 6. Don’t miss a learning opportunity. Regardless of whether you make the cut or not, don’t miss the opportunity to learn. Keep your eyes and ears open. The staff and veteran members are experts at marching music, and great examples of what you should emulate. Many world class groups also offer the ability to attend and participate in auditions without being considered for membership. If you’re young and inexperienced, this is a great way to learn and prepare yourself to audition in the future. 7. Take any opportunity you’re offered. While it’s disappointing when you’re not offered a spot or membership with your instrument of choice, don’t decline the opportunity to join the group in another role. For instance, if you are offered a spot in the pit even though you auditioned for snare drum, take it! Don’t decline an opportunity to perform and gain experience just because you’re disappointed. The experience and skills you gain will still benefit you, and prepare you to audition for snare in the future. With this advice in mind, you should be ready to audition for a winter drumline or drum corps. Remember, there’s no shame in failing! Prepare well, be confident, and chances are you will eventually make that group you admire. Get to work, auditions are rapidly approaching! Welcome back to the Chops blog. Occasionally when a school is faced with needing to replace their synthetic bars, or have them retuned, the question pops up of how long they normally last before needing replaced or retuned. There are many factors that go into answering this question, so I contacted our friends at Pearl/Adams, Yamaha and Majestic to get some input on the topic. There’s no “absolute time scale” for when bars will lose their resonance, or need retuned or replaced, but here are some things to think about to help answer the question. Environment – Is the instrument used only indoors in a concert setting, or is it exposed to the outside elements for marching band? Damp conditions aren’t good for any instrument, and “baking” in lots of sunlight can cause bars to lose resonance. Be sure to cover the instruments during summer rehearsals when not in use. Frequency Of Use – Is the instrument used primarily in concert band classes through the year, or is it used more frequently (band class, after school marching band rehearsals, indoor drumline, Saturday rehearsals, summer rehearsals, etc.)? Obviously, the more you play it, the quicker the bars might need retuned or replaced. The warm-ups alone that are played during marching band will exceed the wear an instrument typically gets in concert band during the course of a day. Mallet Choice – If being used for indoor concert band, be sure to use appropriate mallets that are not too heavy or too hard. These will shorten the life of the bars. It is fairly common to use heavier, and possibly harder, mallets for marching band and indoor drumline. While allowing you to get better projection from your mallet instruments, you could also be sacrificing the life of the bars. Technique – Are the players using a relaxed, musical approach to the instrument and allowing the bars to vibrate and resonate freely, or are they too aggressive and “pounding” the bars? Here’s an unofficial guide to how long an instrument could last before needing bars retuned or replaced. Again, this is not an official timeline. Remember, these are percussion instruments and you are hitting them. Many factors can have an affect on the lifespan of the bars, as described above. Light Use – In the perfect situation of light indoor concert use with appropriate mallets and technique, you might not have any issues for 10 or more years. 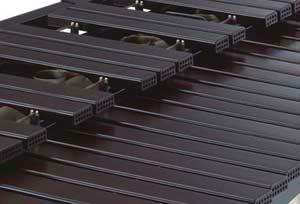 You might even be lucky enough to get 15-20 years out of your marimba bars before needing any retune/replacements. Xylo bars could wear quicker, and tend to be affected even more by mallet choice and technique. Moderate Use – In a situation of minimal exposure to the outdoor elements, with appropriate mallets and technique, you could get 5 or more years of use before needing any retune/replacements. Heavy Use – In heavy use with frequent exposure to outdoor elements, you could possibly require retuning or replacements within 3-5 years. Remember also, mallet weight and hardness will also play a role in how long your bars will last. A program using their mallet instruments constantly, year-round for summer rehearsals, marching band, indoor drumline and concert band will need to replace or retune bars with much more frequency, especially if using heavy and hard mallets for projection and/or durability.